Whew, finally my first DIY post! Don't get me wrong, I love to craft and create things that I've put some hard work into, but the project idea always sounds WAY better than the actual execution. You have to go find/buy all the supplies, have the time to actually DO the project, and then have a need for said crafted item. With the coming move to my new place, I now have a need for some more furniture. I'm getting over the "get it cheap and cry while assembling" IKEA phase and I'm now on to the "find it on craigslist and make it better" phase. I've had some success finding promising pieces on craigslist...nothing to craft yet though. I already have a dining room table that we've been storing in one of the many closets. It was from our house in CT and we ended up not needing it here in Dallas. But now I needed chairs. Ugh. Hunting for 4 matching chairs under $100 that somewhat matched this stained wood table sounded more or less horrific. 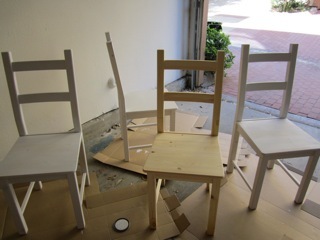 Plan B: Find some decent (and cheap) unfinished chairs at IKEA and then let my creative juices flow. 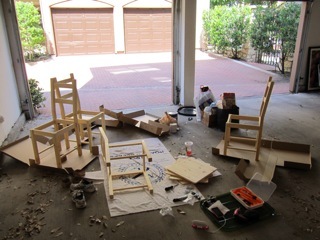 "Disrobe" the chairs from the packaging and save the boxes to use as surfaces to catch paint drips down the line. Assemble all four chairs. This process should only take you about 45 minutes. It just so happened to be 90 degrees in Dallas that day and our garage gets NO breeze....needlesstosay, I was melting. Here are the chairs - seat-less. Since the chairs come "ready for paint" as advertised on the IKEA box, you really don't need to sand them before priming. Paint each chair with a thin coat of primer. 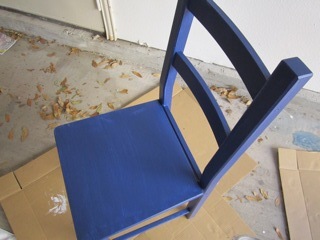 This doesn't have to cover the wood completely as this is just a barrier between the chair and the blue paint so that it doesn't soak in.Once you've primed all the chairs, they might need a slight sanding because the primer can leave little bumps, wood fuzzies or other impurities behind. This part only took me about 10-15 minutes and I mostly focused on the seats. 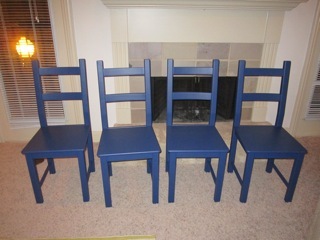 Now each chair gets a coat of navy paint. Be careful not to "glob/glop" it on. This should be an even, complete coat. You will see white streaks showing through, do-not-panic (like I did - "Ew this looks horrible, I can't put these chairs in my house"). I completed steps 1-3 on Saturday. I worked on the chairs from about 2:30pm to about 6:30pm. I'm pretty meticulous and didn't have any help so time may vary for you. You'll notice that the second coat makes ALL the difference in the look of the chairs. They suddenly look perfect and professionally painted. Can you tell that I was thoroughly impressed with myself? The chairs will need a good couple of days to dry. The less humidity the better (duh). I'm really happy with the overall result. They are just the color I was hoping for and I think they will match my design ideas. I'm picturing them with blue and white patterned cushions or maybe even orange ones (but that was a given).